"For each field of physics, the text presents the best stories, the latest research results, the best animations, the best images, the most interesting physical puzzles and the most telling physical curiosities. It includes more than 700 animations, films and illustrations, 120 tables, 1900 challenges and puzzles, and 1100 internet links." The project was begun in 1997 and is now in its 23 edition. The text is downloaded over 30,000 times a year. The text can be read online, downloaded in pdf format. 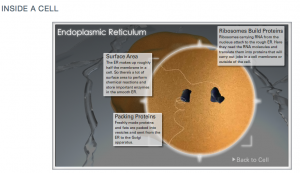 This site contains a number of animations designed to explain various aspects of cell biology. The topics include: cell membranes, glycolysis, Golgi apparatus, Mitochondria/electron transport (to name a few). This site is much slicker than the one listed above:http://learn.genetics.utah.edu/content/begin/cells/ Click on "Inside a cell" and you'll be taken to the outside of a cell. Mouse over the cell, and you'll get a look inside. Click on an organ, and you'll get a slick video, complete with sound effects describing the organ and what it does.